“American Woman” by the Guess Who (based in Winnipeg, Manitoba) hit the top of the Billboard Hot 100 list for three weeks in May 1970. Musician Burton Cummings was born on December 31, 1947 in Winnipeg, Manitoba. He was a member of The Guess Who and was the first Canadian to have a quadruple platinum-selling album in the U.S. for his 1978 album Dream Of A Child. Bryan Adams, Singer/songwriter, was born in Kingston, Ontario on November 5,1959. He was the first Canadian musician to sell one million alburms in Canada with his 1984 album Reckless. Shania Twain, Canadian country music star, was born Windsor, Ontario on August 28, 1965. Her second album (1995) The Woman in Me, holds the record for most weeks at Number One on Billboards’s country album chart. It resided there for 29 weeks at the top and has sold more than 7.7 million copies. Alanis Morissette, musician, was born in Ottawa on June 1, 1974. She still holds the record for the best-selling American début for a female solo artist, for her 1995 album Jagged Little Pill. The album won four Grammys and has sold more than 33 Million copies. The band April Wine (from Halifax, Nova Scotia) became the first Canadian group to make a Platinum album (100,000 sales) in Canada just for advance sales, for The Whole World’s Goin’ Crazy which was released in September 1976. They also hold the record as the first tour to gross $1 million. Céline Dion was born on March 30, 1968, in Charlemagne, Quebec. She was the first Canadian to receive a Gold Record in France. She did this in 1983 at just 15 years old. Justin Bieber was born in Stratford, Ontario, on March 1, 1994. He is the first Canadian musician with five Number One albums on the Billboard 200 chart before turning 19 years old. He achieved this for his album My World 2.0 (2010), Under the Mistletoe (2011), The Remixes (2011), Believe (2012), Believe Acoustic album (2013). I hope you enjoyed the post. Who are your favourite Canadian musicians? 15.9% of the population is 65 or older. 68.5% are between the ages of 15 and 64. 17% of Canadians are daily smokers. 280,681 new permanent residents were welcomed to Canada in 2010. That number does not include temporary workers or foreign students. About 90% of Canada’s population is concentrated within 160 kilometers (100 miles) of the Canada/U.S. border. Canada features the longest coastline in the world, stretching 202,080 kilometers (125,570 miles). Canada has over 30,000 lakes. Canada has ten provinces and three territories. Canada is home to about 55 000 different species of insects. Canada is rich in resources such as zinc, nickel, lead and gold. Canada is the second largest country in the world by total area (Russia is the largest). Canada officially got its own national flag on February 15, 1965 — almost 100 years after it became a country (in 1867). Canada shares the longest land border in the world with the United States, totaling 8891 kilometers (5525 miles). Canada’s only desert in British Columbia is only 15 miles long and is the only desert in the world with a long boardwalk for visitors to walk on. Canadian sports icons include Wayne Gretzky (hockey), Steve Nash (basketball), Mike Weir (golf) and Cassie Campbell (women’s hockey). Canadians call the one dollar coin the loonie. When in full production, 15 million loonies can be produced per day. Canadians can deduct a number of things from their tax software, but I bet you didn’t know that dog food is tax-deductible in Canada. Canadians generate 640 kilograms per person per year of waste. Despite being a huge country, Canada has the fourth lowest population density in the world, with only three people living per square kilometer! Almost half of the population in Canada were born in other countries. Graeme Ferguson co-invented IMAX. There are over 500 IMAX theaters in 45 countries. Ice hockey, football and baseball are Canadians favorite spectator sports. In 1576, Martin Frobisher discovered the strait that bears his name. In 1792-94, Captain George Vancouver painstakingly surveyed the west coast of Canada. It wasn’t until 1610 that Henry Hudson sailed through Hudson Strait into Hudson Bay. Its population density is 8.6 people per square mile, making Canada the ninth-most sparsely populated nation in the world. John Cabot was the first explorer to reach Canada in 1497. Navigation of the north-west passage from the Atlantic to the Pacific was first achieved by the Norwegian explorer, Roald Amundsen in 1906. Newfoundland didn’t become a province until 1949. No cows in Canada are given artificial hormones for milk production. Six cities in Canada have a population of over 1 million: Toronto, Montreal, Vancouver, Calgary, Edmonton and Ottawa. The 2 main languages spoken in Canada are English and French. The Bank of Canada opened its doors in 1935 and issued its first bank notes. The CN Tower in Toronto was the world’s tallest free-standing structure until 2007. The Royal Montreal Golf Club, founded in 1873, is the oldest golf club in North America. The S&P/TSX is the fourth largest exchange by market cap in the developed world. The US buys more oil from Canada than any other country. The US, the UK and Mexico are the top countries visited by Canadians. The age at first marriage for men is 29 years, 27.4 years for women. The average Canadian watches 21 hours of television per week. 128,000 Canadian households have TV’s in the bathroom. The average household size in Canada is 2.6 people. The average life expectancy at birth is 81.16 years – the sixth highest in the world. The capital city of Canada is Ottawa. The east coast of Canada was settled by Vikings in about 1000 AD. It’s definitely worth a visit to L’Anse aux Meadows. The first indoor ice hockey game took place on March 3, 1875 at the Victoria Skating Rink in Montreal. The largest non-polar ice field in the world can be found in the St. Elias Mountains, Yukon Territory. It covers an area of 40,570 square kilometers of which 16,900 square kilometers are in Canada, the rest being in Alaska. The longest highway in the world is the Trans-Canada Highway which is over 7,604 kilometers (4,725 miles) in length. The median age is 41 years. The most popular sport in Canada is ice hockey. The name Canada comes from the word ‘kanata’ which means ‘settlement’ or ‘village’ in the language of the indigenous St Lawrence Iroquoians. The official languages of Canada are English and French. The population in Canada in 2011 was about 34.3 million. The regent of England, currently Queen Elizabeth II, is the Canadian head of state. There are 459 cars for every 1000 people. There are about 200 species of mammals in Canada. There have been 10 Nobel Prize laureates in Canada. Thomas Ahearn invented the electric cooking range in 1882. Whistler, British Columbia is consistently ranked as one of the best places in North America for downhill skiing. 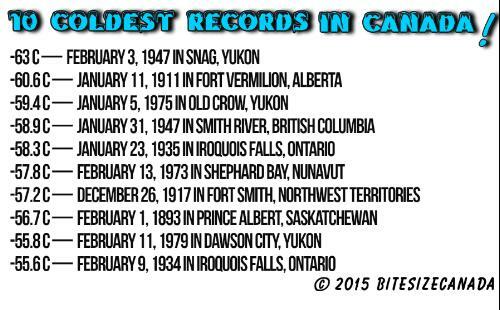 Winters can be very cold in Canada with temperatures dropping below -40 °C (-40 °F) in some parts of the country. You can swim with beluga whales in Churchill, Manitoba. You’ll find about 630 bird species in Canada. Recognised regional languages include Chipewyan, Cree, Gwich’in, Inuinnaqtun, Inuktitut, Inuvialuktun, North Slavey, South Slavey and Tłı̨chǫ. Currently, the Governor General is David Johnston, and the Prime Minister is Stephen Harper. The Vikings were the first Europeans known to land in Canada, in what is now Newfoundland, led by the Viking explorer Leif Erikson. Commonwealth Day is the annual celebration of the Commonwealth of Nations held on the second Monday in March, and marked by a multi-faith service in Westminster Abbey, normally attended by Queen Elizabeth II as Head of the Commonwealth, with the Commonwealth Secretary-General and Commonwealth High Commissioners in London. The Queen delivers an address to the Commonwealth, broadcast throughout the world. While it has a certain official status, Commonwealth Day is not a public holiday in most Commonwealth countries, and there is little public awareness of it. In Canada, the only official recognition is a federal government stipulation that the Royal Union Flag be flown alongside Canada’s flag at government installations nationwide, “where physical arrangements allow…. Physical arrangements means the existence of at least two flag poles”. The 1964 parliamentary resolutions creating the Maple Leaf flag also retained the Union Flag as an official symbol of Canada’s membership in the Commonwealth, and allegiance to the Crown. You can participate via social media: on Facebook or Twitter. Tag your social media posts with the hashtag #YoungCommonwealth. For more information I suggest Event Brite for Toronto’s celebrations, and “The Commonwealth” webpage for lots of information, quiz, and more. Basketball is a sports game that’s familiar to everyone worldwide. I don’t think there are many who do not know about basketball, or even a few rules of how the game is played. But some do not know the history of the game. Allow me to offer a quick refresher. James Naismith, Canadian educator and a sports recreationalist, invented the game in 1891. It took Naismith and his team about 14 days to form the rules of the game. That basketball was initially played using peach baskets as hoops. That it was then played with 9 players on the court per team. That the first ball use in basketball was actually a soccer ball. Throughout the years, basketball has been polished and the rules were changed that only 5 players per team are now playing on the court. The peach baskets were also replaced by iron rims with nylon nets beneath. The point system was also refined. The soccer ball was replaced with an official basketball. Long range shooting or the three-point shot were also included in the game. James Naismith was born on November 6, 1861 in Almonte, Ontario (Canada); he passed away on November 28, 1939 at the age of 78 in Lawrence, Kansas (United States). He studied physical education in Montreal (Quebec) before moving to the United States, where he developed basketball while teaching at the International YMCA Training School (now Springfield College) in Springfield, Massachusetts. 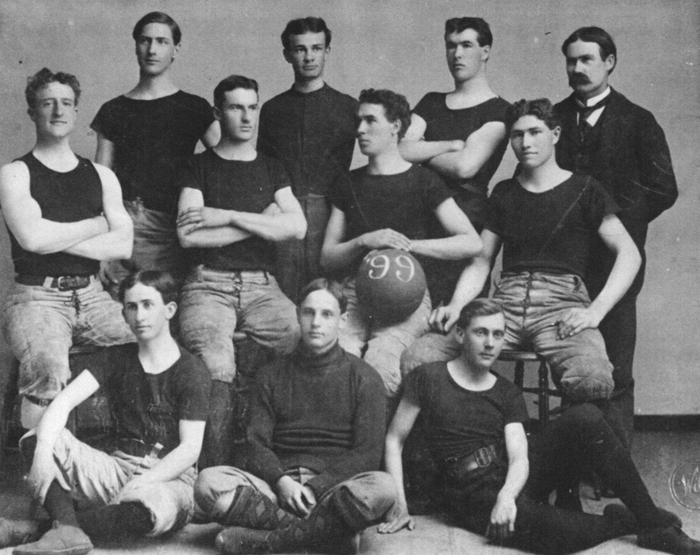 First basketball team at the University of Kansas, 1899. Coach James Naismith is on the far right. Source http://www.kumc.edu/research/medicine/anatomy/sutton/biology_and_basketball.html Author: Clendening History of Medicine Library, University of Kansas Medical Center. Naismith was also a National Guard chaplain with the First Kansas Infantry Regiment. He taught his soldiers basketball to control their excess energy. His effort helped increase morale and even lowered the rate of disciplinary actions among soldiers. He lived to see basketball adopted as an Olympic demonstration sport in 1904 and as an official event at the 1936 Summer Olympics in Berlin, as well as the birth of both the National Invitation Tournament (1938) and the NCAA Men’s Division I Basketball Championship (1939). Naismith’s contributions to basketball have earned him several posthumous honors, such as in the Canadian Basketball Hall of Fame, the Canadian Olympic Hall of Fame, the Canadian Sports Hall of Fame, the Ontario Sports Legends Hall of Fame, the Ottawa Sports Hall of Fame, the McGill University Sports Hall of Fame, the Kansas State Sports Hall of Fame, and the FIBA Hall of Fame. The Naismith Memorial Basketball Hall of Fame in Springfield, Massachusetts, where he is a member of the original Hall of Fame class, was named in Naismith’s honour. I just learned about Nova Scotia giving Boston a big tree every Christmas. Absolutely amazing. Let me tell you about it. Christmas Gift for Boston from Nova Scotia. In 1918, Halifax sent a Christmas tree to the City of Boston in thanks and remembrance for the help that the Boston Red Cross and the Massachusetts Public Safety Committee had provided immediately after the disaster. That gift was revived in 1971 by the Lunenburg County Christmas Tree Producers Association, who began an annual donation of a large tree to promote Christmas tree exports as well as to acknowledge Boston’s support after the explosion. The gift was later taken over by the Nova Scotia Government to continue the goodwill gesture as well as to promote trade and tourism. The tree is Boston’s official Christmas tree and is lit on Boston Common throughout the holiday season. Knowing its symbolic importance to both cities, the Nova Scotia Department of Natural Resources has specific guidelines for selecting the tree. It must be an attractive balsam fir, white spruce or red spruce, 12 to 16 metres (40 to 50 ft) tall, healthy with good colour, medium to heavy density, uniform and symmetrical and easy to get access to. This year, John and Ethel Ann MacPherson of Purlbrook, Antigonish Co., are donating the tree for Nova Scotia to give to the city of Boston. The 13-metre (43-foot) white spruce is about 55 years old. It was cut during a festive public ceremony Monday, Nov. 17. Each year, the Nova Scotia tree for Boston stands proudly in Boston Common throughout the holidays. The annual event attracts more than 30,000 people each year and 300,000 more tune in to watch the live televised event on ABC. The Nova Scotian government is always looking for the best tree to send to Boston. If you think you have what they want, here are the criteria and ways to get in touch: If you have or know of a white or red spruce or balsam fir with the following characteristics we want to hear from you. Please take a photo to the nearest Department of Natural Resources Office or send one to Tim Whynot at whynottw@gov.ns.ca Tim can also be reached at 424-3615. To read more about this special Christmas gift and its origin, I highly recommend clicking your way to Nova Scotia Government information pages; you can follow the tree’s transport via twitter and facebook. A few media site that have covered it this year are the CTV News Atlantic, the CBC News and the Bostinno.